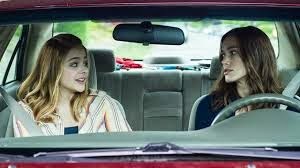 Lynn Shelton the indie director/writer of such gems as Your Sister's Sister and Humpday is traversing into a more commercial enterprise working from a script by Andrea Seigel. The cast of Keira Knightley, Sam Rockwell and Chloë Grace Moretz are more than competent and amusing. Unfortunately it lacks the quirky everyday unknown as Shelton's previous films and borders on a unbelievable scenario that while entertaining to watch, keeps one from embracing the final product. Knightley rocking an American accent plays Megan, a woman that is unfocused, drifting and can't seem to figure out what's she's doing in life. She's been living with her boyfriend Anthony (Mark Weber) from high school and working as a “sign girl” for her dad's (Jeff Garlin) tax business. In her circle of friends from school she remains unmarried, childless, and no career. Despite as her mother reminds her that she has an advanced degree. One of her friends, Allison (Ellie Kemper) an uptight Bridzilla is frustrated with her friend's inability to take things seriously. During the wedding, her long time boyfriend decides to propose to her on the dance floor, and Megan is saved from answering when Allison sends her on an errand. On the way out, she sees her beloved father making out with someone not his wife. Freaked and confused she ends up at the liquor store where teenage Annika (Moretz) asks her to buy her some beer. Megan, Annika and her friends end up drinking and hanging out. Anthony, not wanting to pressure her on the proposal is happy to hear that Megan agrees to marry and has decided to take a week at a self improvement seminar so she can finally get a job and her life together. Instead she calls Annika and asks if she can crash there for a week. Annika's father, Craig (Sam Rockwell), discovers the visitor and the expected breaks out. The situation makes for some chuckle out loud moments, but it's hard to imagine a grown woman with a series case of arrested development to want escape to a world of teenage angst to work out her own problems. The teens see her as “cool” which probably makes living in their world inviting. Craig seems to enable Megan by allowing her to stay, and even feel attracted to her. Eventually Megan will have to face her boyfriend, her father, her besties, and figure out just what the heck she is doing. Knightley with her wide engaging smile is funny and endearing, but that greasy hair and shabby clothes is a bit distracting. Interesting, but wish that Shelton wrote it instead.